Baku, an organizer and venue of many major international sporting event, will once again get together sporting community in 2018. Only 60 days left to the first Baku European Games, which will feature 20 sports, including gymnastics disciplines. Overall, about 450 of gymnasts will compete for 34 sets of medals. 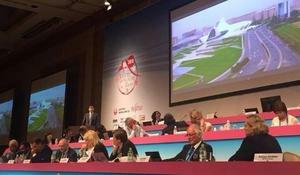 Baku 2015 European Games has confirmed the results of the Gymnastics competition draw which took place in the National Gymnastics Arena in Baku. February is around the corner, and in the meantime the European Games are getting closer and closer. A grand event, to be held for the first time in history, will bring together 20 types of sports. Among them there will be all gymnastic disciplines, including rhythmic, acrobatic and aerobic gymnastics, women's and men's artistic gymnastics and trampolining. The National Gymnastics Arena will host the Baku Championships in Aerobics on February 7.